A barista pulls a shot from one of last year's competitions. Sam Watson is more of a chai sipper than a coffee drinker. But don't let that fool you. The 22-year-old Martinez-native knows a lot about coffee and she can pull a mean shot or two. Watson and Julian Gray are two Bay Area baristas who are competing in Peet's Coffee & Tea's fourth annual National Barista Competition Finals. The two Bay Area products will face off against baristas from Portland and San Luis Obispo. Watzon and Gray have had to go through several rounds of competitions to make it to the finals, which take place Friday in Alameda. And that doesn't include the off the clock practice that goes into pulling the perfect shot. "I've put in over 60 to 70 hours of practice time off the clock," Watson said. Gray likes to practice in his own time too but for him the art of pulling the perfect shot can be a form of meditation. "I am a firm believer in not over practicing<" he said. "The way that I prepare is to mediate more and mellow out and maybe I'll have a beer before I go to bed." Each contestant at Friday's competition will make four shots of espresso, four traditional cappuccinos and something from Peet's signature beverage series. They will not only be judged on their coffee making ability but their behind the counter demeanor and their knowledge of the coffee they are serving. "A lot of what they judge us on is our customer service skills," Gray said. "A lot of it is the passion we put into pulling the drinks as well." And do they have a favorite drink they like to make? “I love making cappuccinos for our customers," Watson said. "Not only does the customer get to experience our deep roasted flavor of our espresso. But the way we steam the milk." Gray said he enjoys making latte macchiatos because he likes how the shots are poured through the foam. The two also have advise for the aspiring baristas in the Bay Area's rich coffee culture. 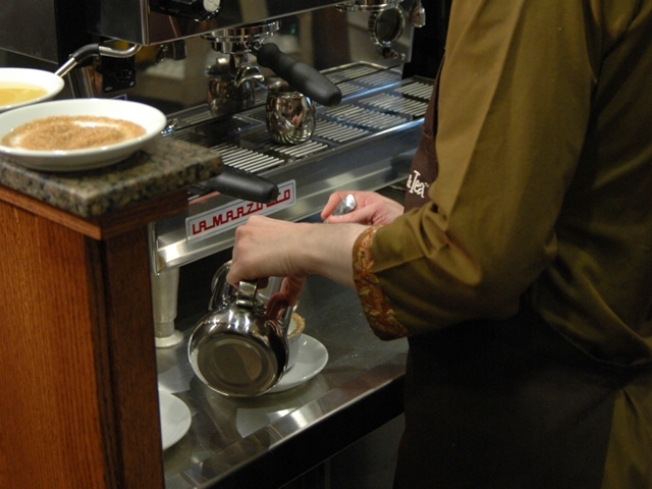 "Tasting is probably one of the most useful tools as a barista," Watson said. "That’s the sense we use the most when it comes to that cup of coffee or having an espresso shot because you can’t just jump on an espresso machine." The two will be competing for their favorite charities, the Oakland Public Conservatory of Music for Gray and the Bay Area Crisis Nursery for Watson.